When I was a youngster in the field of whisky lore, I was introduced to a fine wee bottle. I had only been partaking in the golden spirit drink for a couple of months and was cramming my mind (and palate) full of as many new and exciting whiskies as humanly possible. Working at a bar with over 300 whiskies meant that, thankfully, I was not short of material to experiment with. In this initial rush, one bottle stood out above all others and cemented its position above all other casualties in my one man war on whisky. This was the magnificent Caol Ila 18. Three years later, it is still imprinted in my mind as the whisky I offer up, when repeatedly asked to name my numero uno. 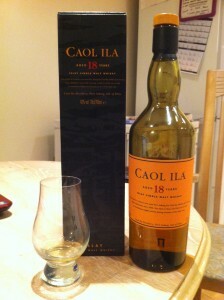 However, in recent times, my faith has waned in Caol Ila 18. I have not managed to try some for about two years! It was becoming increasingly hard to get hold of, other whiskies I had originally held with high esteem, upon re-tasting had faded out of my mind and, as with all of us, my palate has changed considerably over the years. Therefore, when tourists at the Scotch Whisky Experience pressure me into choosing a favourite whisky (and boy, do they pressure! Round after round of questions until I give an answer, never accepting a truthful ‘It changes all the time’ or ‘it depends on my mood’) I eventually, and somewhat grudgingly, state that Caol Ila 18 is my favourite. Palate: Actually very similar to the nose, but maybe not as big as I remembered. Peppered, light chocolate tingle around the outskirts of the palate. A smooth, salty wave brings a hint of smoke to the palate. Well rounded, warm and encompassing, again with this dry, bonfire note. Not as direct and sharp as the nose suggests, but for once I don’t mind. Finish: To be perfectly honest, not as great as I was hoping for. Not disappointing by any means, but not quite the mythical glow of ascension that I was hoping for. Warm, slightly medicinal and comforting. Person: Captain Haddock (Tintin). Mature, coarse and heroic. Legendary and yet oddly sincere. Plus he likes a wee drinky! Overall: I have decided that this whisky will indeed fall under the category of excellent. Having just tasted it, I am finding it very hard to think of any other whisky that I would rather have in my hand. I know this is probably due to my excitement of finally trying this again but I have no doubt that it will remain as one of the best whiskies I have ever tried. Number one? I will probably never be able to decide. However, under the probing inquisition of the hounding tourist, I will most likely concede to pressure and name Caol Ila 18 my theoretical dram of choice. This entry was posted	on Thursday, January 12th, 2012 at 10:12 am	and is filed under Reviews. You can follow any responses to this entry through the RSS 2.0 feed. Responses are currently closed, but you can trackback from your own site.